The Girls in Gis (GIG) as we know now is the same Girls in Gis that the OG’s like Belinda Bueno Serrano knew then, except she’s (Girls in Gis) all grown up now. Belinda is one of the original women who has been a part of the GIG movement since the beginning when Ashley set iti into motion. Belinda says that she maybe bias because she admires the ladies who work tirelessly behind the scenes, but she has always know that Girls in Gis would be successful. She says the mission statement speaks for itself and that alone is enough to get any female to try Brazilian Jiu-Jitsu (BJJ). She also includes that the BJJ sisterhood is strong. Girls in Gis helps to bring that together, let it be shown and that is empowering. Belinda is a wife, a mother and a grandmother that puts the cool in Jiu-Jitsu. 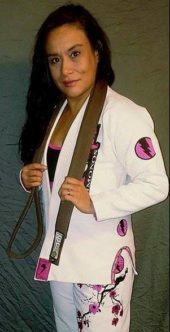 She began her BJJ adventure in 2008 at Elite MMA in Baytown and currently trains at Combat Nation with the RCJ Machado Association under black belt, Anthony Bernabeo. For the Serrano family Martial Arts are a family affair. Her and her son are brown belts, her daughter is a purple belt, and her granddaughter is a 3 stripe white belt. She says she has two more granddaughters who currently are being taught the basics at home and will be starting formal classes as soon as they are old enough. She said she found Jiu-Jitsu when she was looking for somewhere closer for her kids to train. At the time she was driving and hour and a half, five days a week to take her son to his Muay Thai class and daughter to her boxing class. She remember seeing the ad in the newspaper for BJJ and decided to check it out. She says it was the best decision she has ever made. 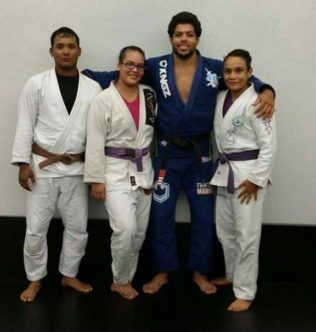 Her son and daughter started BJJ first, but it wasn’t long before Belinda followed. She says at first she was afraid, but with the support of her instructors Frost and Jordan she found courage to stay. What sealed the deal for Belinda was when Elite had an in house tournament. Hearing Eric and Hai speak; meeting others who trained and listing to all of them share their testimony was what affirmed her decision. Belinda says the best part of having a family full of BJJ practitioners is they can have a class at home anytime they want. She says that she definitely thinks BJJ has made her family closer. Even though her kid are all grown up with families of their own and none of them train at the same academy, BJJ still unites them. Belinda hopes that they can all train at the same academy again one day. 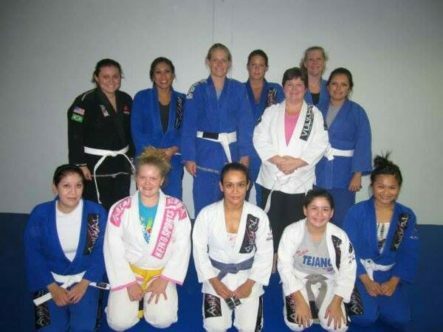 Belinda has been teaching BJJ to women since she was a blue belt which she says has been a great experience. She says when she she started out she had about twelve ladies attending regularly every Friday. She said that some ladies went on to train with the regular class and some felt more comfortable with the all female class only. Some of the women who started in her class are still train till this day. Since moving academies, she is not currently teaching BJJ classes, but it is in the works. Belinda says she wants to start a women beginner BJJ class for the parent of students who don’t train and women who take the kickboxing class who don’t train BJJ. She wants to show them that everyone, if given the opportunity they can train BJJ. She wants them to know that size isn’t a factor, age isn’t a factor, gender isn’t factor, fitness level isn’t a factor, anyone can train BJJ. Belinda says that even if you don’t have females to train with, everyone should train regardless. But it is nice to have other females on the mat with you and to experience that BJJ sisterhood connection. She says some of the benefits of having women to train with is having someone who matches your size to be able to drill and learn technique with. For instance she says she personally would rather learn how to do the triangle the first time on someone her size than someone who is taller then her and out weighs her by 70 lbs. But if given no other choice she would. Coming up the ranks Belinda had very limited female training partners. She said the only female she that she trained with regularly was her daughter and the only other one available to her was Ashley Freeman Nguyen (of the Elite Westheimer location). She said that in order to train with Ashley either she had to make a trip to Houston or Ashley would come to Baytown. When Ashley told Belinda of her purpose to form Girls in Gis and her plan to host an event once every month, Belinda was beyond excited about the idea. Belinda remembers Ashley saying “get anyone to come, even if they don’t currently train, we are gonna get them to start”. Each event Ashley would bring a box of gi that she owned and she even brought some of her husband Hai’s gi for new girls to borrow. It was a new experience for Ashley and she was playing it as it went along. Ashley had Hai, who is a black belt and other males from Elite MMA come in and help her show technique and answer any question the girls had. At the time they had no black belt females to train with. As a purple belt, Ashley was the highest belt. 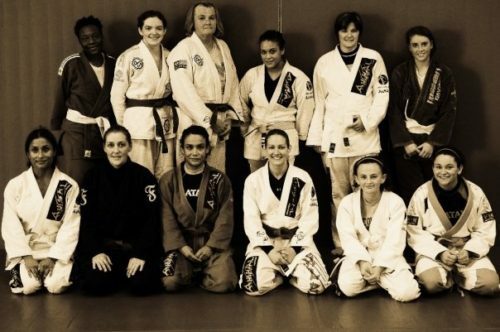 Girls In Gis was held at Elite MMA for awhile before Ashley started having them at other schools. When other schools started hosting them it gave the group great exposure. Belinda says meeting other women that train like Triin (of Fenom Kimonos) and hearing about their journey was an amazing experience. 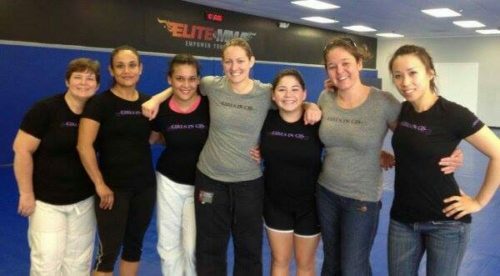 It was then that Belinda learned how powerful the support of the BJJ sisterhood can be and it has since become a vital part of Belinda’s BJJ journey.